China has said the UN and its Security Council must not cede its leading role in the global fight against terrorism. China is a permanent member of the UNSC. “The United Nations and its Security Council have to play a leading role in the global war on terrorism. This is the only way to maintain unity, achieve effective coordination and take concerted actions,” Chinese Foreign Minister Wang Yi said at a UN Security Council summit on terrorism on Wednesday. All military actions must comply with the UN Charter and the relevant Security Council resolutions, urged Wang. The Chinese Foreign Minister’s comments came as the US military launched a fresh round of air strikes on Syria, targeting fighters of Islamic State in Iraq and the Levant (ISIL). 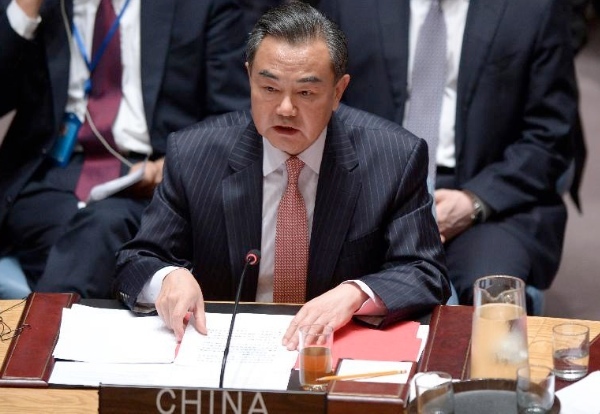 “The global war on terrorism should be fought with an integrated approach … with a view to addressing both the symptoms and root causes of terrorism, especially removing its root causes and breeding ground, ” the Chinese Foreign Minister told the UNSC. China has also criticized “double standards” in condemning acts of terror in different parts of the world, in an apparent reference to the US. The Obama-administration had, for a long time, refused to label violent attacks in Xinjiang as terrorism. Instead, US State Department spokeswoman Marie Harf had, after a terror attack in December 2013, called on the Chinese government to “permit its citizens to express their grievances freely, publicly, peacefully and without fear of retribution”. “Any act of terrorism, in whatever form, whenever and wherever it is committed, and whomever or whatever it is targeted against, must be fought resolutely. No double standards should be adopted, still less should terrorism be identified with any particular ethnic group or religion,” Wang said on Wednesday at the UNSC. China is fighting a surge of violence over the past year in Xinjiang where militant groups are fighting for an independent state called East Turkestan, the government claims. More than 200 people have died in unrest in Xinjiang in the past year or so, the government says. Wang, on Wednesday, also vowed to support Iraq in increasing counter-terrorism capacity- building, saying China is willing to partner Baghdad in intelligence sharing and personnel training. China will also provide more emergency humanitarian assistance to Iraq, including its Kurdish region, he announced. In opening remarks at the Un General Assembly on Wednesday, UN Secretary-General Ban Ki-moon said human rights are under fire around the world.